It was right under my nose at the ranch. This terrific teak bench we bought from our good friends who had lived in Indonesia and all over the world. I looked on the Internet for a white tufted seat bench that could double as end-of-master-bed seating. With my outdoor wide-brimmed gardening hat, a green blanket rolled to look like a bolster pillow, and a pillow from Marshall’s Homegoods. One could easily find these at Walmart too. Notice how it makes the space appear BIGGER. It kind of fools the eye and gives the bed a sleigh bed type look too. We are done with ranch renovations and ready for potential buyers. Our real estate agent said “Wow, Fabulous!” yesterday! 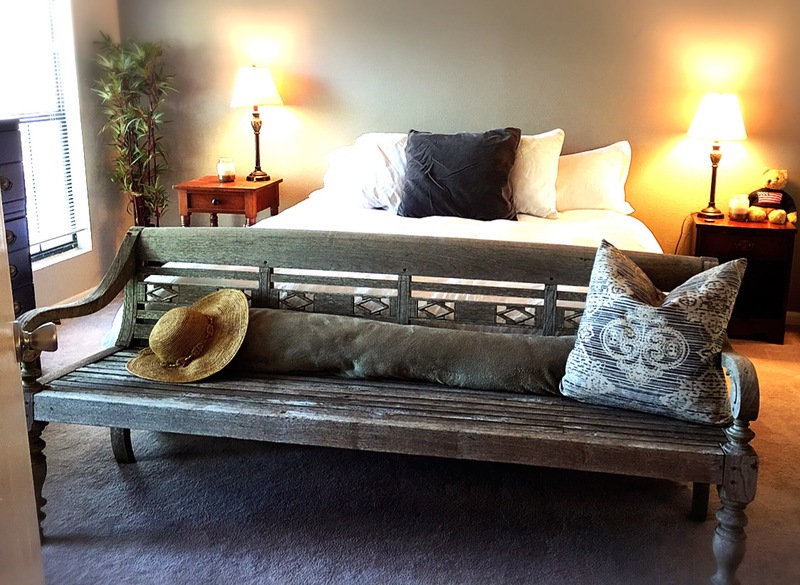 This gem of a bench is coming with us to Sedona! ← Dior bag or a water well in Africa?